What Are Some Differences Between Fat and Muscle Tissue? So many people are hung up on their body weight, but fail to realize that the more important issue is their body composition. All there is to us is fat, muscle and bone. Our body weight is equal to the sum of these parts. I hope this illustration will help you to see the issues clearer. 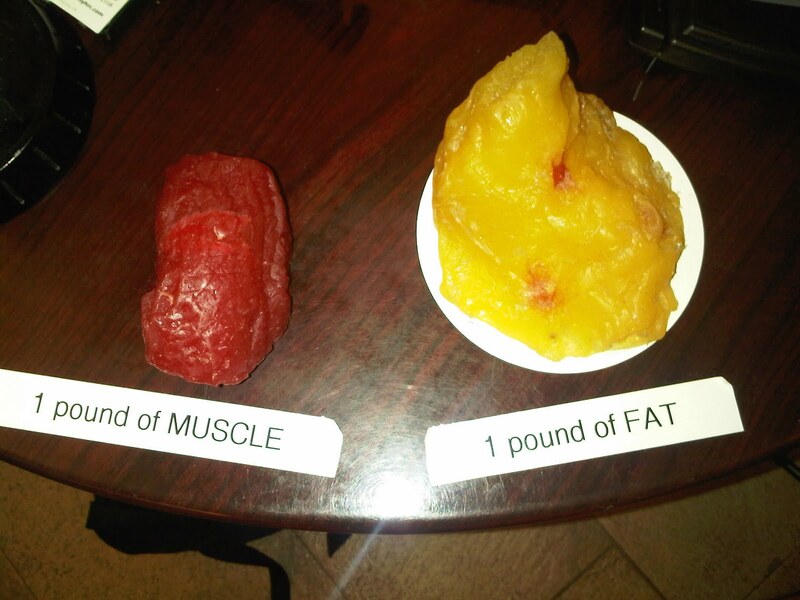 It is clear from this picture that fat weighs less than muscle, so it takes up much more space than muscle. Once you have an idea how much more space in your body that fat takes up, you can understand the importance of knowing your percentage of body fat. You can read about how to measure your body fat percentage in an earlier post. Once you know this you will have a baseline from which to work. This is important because often when a person starts to do cardio and resistance exercises his weight doesn’t tell him there is much change going on. Yet, if he is burning fat and building muscle, his body will be changing in important ways. Shirts will fit differently, pants will become looser around the waist line. Another important consideration in body composition is that one pound of fat burns about 5 calories each day while one pound of muscle burns 50 calories in a day. So, once you get yourself on the road to fitness and start building muscle and burning fat, you will be transforming yourself into a calorie and fat burning machine. You will have started a wonderful positive spiral. Similarly, if you are overweight, once you learn your percentage of body fat you will have a guideline against which to measure yourself by and you won’t be troubled by the fact that you ‘aren’t losing weight,’ when you begin an exercise program and start trying to eat in a more healthy manner. You will be burning off fat and muscle weighs more than fat. Often when an overweight person starts working out and getting healthy he/she finds that their close fit looser/better despite no change in their weight.